HD SDI video signal can be transmitted through one single fiber with non-distortion, high-quality, long-distance transmission. This series of video to fiber converter is with Stable performance, clear picture quality,and high Stability for LED Status Indication on the body of device. The working status of devices can be visually observed. At the same time,the switch value,voltage,working status and other reverse useful signal information can be controlled by data RS485.This makes our devices more flexible when different customers’ request comes. 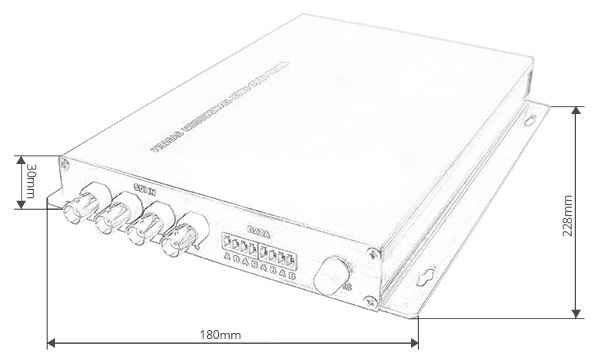 The FM3040D could transmit HD/SD-SDI as per SMPTE 424M-2006, 292 and 259, with or without embedded audio and data, as well as DVB-ASI over one single mode or multimode fiber. Signals are equalized and re-clocked prior to fiber optic transmission. And HD-SDI Unidirectional Fiber Optic Transmitter should be worked with HD-SDI Unidirectional Fiber Optic Receiver.The price on the website is for Pair. 3. SDI-DATA: Turns on when SDI signal is input; turns off when there is not. 485/232: Turns on when there is reverse data signal output, or turns off when there is not. 1.Audio and date port : For Stand-alone equipment,it could be up to 4 channel,for 1 U Rack Mount packaging ,it available for 8 channel or more. Please contact us by email to [email protected] if you have any requirement for it. 2.Fiber Port: FC and ST is available,and for SC/LC connector,Fiber-Mart will provide you a corresponding patch cable for connector conversion for free. 3.1 U rack mount: The standard is with 4 slots,Fiber-Mart will offer you dam-board for free when some slots is empty. 4.SNMP: If the equipment is with SNMP function,the dimension will be changed and it will packaged by rack cassette.